Exceptional linearity & accuracy at high update rates. DIN Rail mounted, digitally programmable. The Laureate RTD temperature transmitter and signal conditioner provides a linearized, highly accurate, stable and repeatable transmitter output for 100 ohm platinum, 10 ohm copper and 120 ohm nickel RTDs. Pt100 platinum RTDs can have a DIN alpha of 0.00385 or ANSI alpha of 0.00392. The RTD type and temperature range, specified in °C or °F, are user-selectable. The temperature range can be as wide as the entire span of the RTD type or as narrow as 150 counts (such as 15.0°), limited only by considerations of electrical noise and digital filtering time constants. Digital calibration of all RTD ranges is performed the factory, with calibration data stored in EEPROM on the signal conditioner board. This allows signal conditioner boards and ranges to be changed in the field with no need for recalibration. Typical accuracy for a Pt100 is better than ±0.04°C (±0.07°F) ±0.01% of reading. RTD excitation is provided by the transmitter. RTD connections can be of the 2-, 3- or 4-wire type. With 3- and 4-wire connections, the transmitter automatically compensates for changes in lead resistance to the sensor. Fast read rate at up to 50 or 60 conversions per second while integrating the signal over a full power line cycle is provided by Concurrent Slope (Pat 5,262,780) analog-to-digital conversion. High read rate is ideal for peak or valley capture and for real-time computer interface and control. Ethernet I/O, isolated. Supported protocols are Modbus RTU and ASCII (tunneled via Modbus TCP) and Laurel ASCII. The latter is simpler than the Modbus protocol and is recommended when all devices are Laureates. 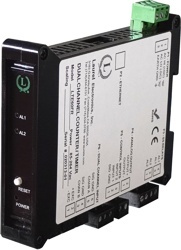 Note that RS232 or RS485 data I/O in lieu of Ethernet is provided by LT Series transmitters. 4-20 mA, 0-20 mA or 0-10V analog transmitter output, isolated, jumper-selectable and user scalable. All selections provide 16-bit (0.0015%) resolution of output span and 0.02% output accuracy of a reading from -99,999 to +99,999 counts that is also transmitted digitally. Output isolation from signal and power grounds eliminates potential ground loop problems. The supply can drive 20 mA into a 500 ohm (or lower) load for 10V compliance, or 10V into a 5K ohm (or higher) load for 2 mA compliance. Dual solid state relays, isolated. Available for local alarm or control. Rated 120 mA at 130 Vac or 180 Vdc. Universal 85-264 Vac power. Low-voltage 10-48 Vdc or 12-32 Vac power is optional. Discovery and configuration of Laureate Ethernet Nodes is easily achieved with Laurel's Node Manager Software, and the discovered transmitters can then be programmed using Laurel's Instrument Setup Software. Both softwares run on a PC under MS Windows and can be downloaded from this website at no charge. Cooling Required Mount transmitters with ventilation holes at top and bottom. Leave 6 mm (1/4") between transmitters, or force air with a fan. RTD hookup can be via 2, 3 or 4 wires to the J5 connector. The transmitter applies an excitation current of 196 µA (Pt 100 and Ni 120) or 5 mA (Cu 10). In 4-wire hookup, different pairs of leads are used to apply the excitation current and sense the voltage drop across the RTD, so that the IR drop across the excitation leads is not a factor. In 3-wire hookup, the transmitter senses the combined voltage drop across the RTD plus two excitation leads. It also senses the voltage drop across one excitation lead, and then subtracts twice this voltage from the combined total. This technique effectively subtracts all lead resistance and compensates for ambient temperature changes if the two excitation leads are identical. In 2-wire hookup, the transmitter senses the combined voltage drop across the RTD and both lead wires. The voltage drop across the lead wires can be measured by shorting out the RTD during transmitter setup, and this voltage is then automatically subtracted from the combined total. However, changing resistance of the lead wires due to ambient temperature changes will not be compensated. With the optional dual solid state relay output option, which has a typical response time of only 17 ms, Laureate temperature meters and transmitters can serve as extremely fast and accurate ON/OFF controllers for closed-loop temperature control. They can also serve as supervisory process monitors and provide alarms or shutoffs when processes exceed normal limits. Click on the radio buttons to build a model number with pricing as shown below. Prices are in US dollars and do not include shipping or duty charges (export sales). Please see our explanations and limitations applicable to pricing and online orders. Prices shown are in US Dollars and are Laurel's manufacturer's suggested retail price (MSRP) in the USA. Orders are processed manually, not directly by our shopping cart system. You don't have to supply credit card information when placing an online order. North American Orders. Laurel does not sell factory-direct in the USA or Canada. Online sales orders are filled through distribution. During the ordering process, you will have the chance to select an authorized Laurel distributor, or you can ask Laurel to refer you to a distributor. The distributor will then contact you to quote shipping, tax and duty (where applicable), and arrange for payment. International Orders. If your ship-to address indicates that you are outside of the USA or Canada and Laurel has a distributor in your country, we will forward your order to that distributor for follow-up. If Laurel does not have a distributor in your country, we will email you an order acknowledgment and a pro forma invoice which states the product price, shipping charges, and wire transfer information, which includes a $25 bank wire transfer fee. Note: The same signal conditioner board can be user configured for all RTD types listed and °C or °F, as well as for resistance measurement.